An impressive opening half saw Kilkenny comfortably defeat Westmeath and qualify for the Bord na Mona Walsh Cup Semi-final. Kilkenny lead 3-12 to 0-08 at the break and finished out convincing 4-18 to 0-18 winners. Kilkenny now meet Wexford in the semi-final next Sunday in O Kennedy Park New Ross at 2pm. Galway play IT Carlow in the second semi-final with the final down for decision a week later. A strong Kilkenny team went on a goal spree in Round 2 of the Bord na Mona Walsh Cup against Antrim at the new GAA Centre of Excelllence in Abbotstown on Sunday. The win almost assures them of qualification as it would take a very heavy defeat against Westmeath in Mullingar on Sunday next to deny Kilkenny a place in the semi-final. Dublin play Wexford on Thursday night with the winners the likely opponents away in the semi-final on Sun 29th Jan. Following a succesful first outing v DCU last week Kilkenny take on Antrim in Round 2 of the Bord na Mona Walsh Cup in Abbottstown next Sunday at 2pm. Eddie Brennan's under 21's lined out against DCU but this weekend will see the senior squad return under Brian Cody and is selectors. The 2017 GAA season gets underway this Thuursday evening when Kilklenny host DCU in the opening round of the Bord na Mona Walsh Cup. The Kilkenny side for this game will be made up of the under 21 squad and managed by u21 team manaager Eddie Brennan, The game throws in at 7,30 at MW Hire Park Dunmore. Supporters are asked to adhere to the requests of stewards and Gardai especially in relation to exit arrangements after the game. 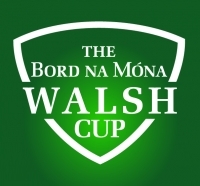 The 2016 Inter County season gets underway this week with two games in the Bord na Móna Walsh Cup hurling tournament. First up Kilkenny take on DIT on Wednesday evening under lights at the MW Hire Training Centre at Dunmore with a 7.30pm throw in. There is limited parking available at the Centre. Please follow the Car Park signs and co-operate with stewards and gardai particularly at the end of the game. Admission is €10 for adults and €5 Students and Pensioners. Under 16's are free. As this is the Leinster GAA "Accident Tournament" passes do not apply. It is expected that the Kilkenny team will comprise predominantly of the under 21 side for Wednesday's game. Kilkenny then travel to Birr on Sunday to take on Offaly at 2pm in the final group match. Offaly have already had a comfortable victory over DIT in the first game. Group winners progress to the semi-finals on Sunday 24th with the final scheduled for Croke Park on Saturday 30th January.